The new suite of genealogical and DNA analytical tools from MyHeritage has literally knocked my ancestry out of the park these past few days. The online service’s The Theory of Family Relativity Tool and AutoClusters obliterated four of my most stubborn ancestral brick walls…and confirmed the identity of a man I have long suspected to be my 4x great grandfather. This article is about that all important ancestral confirmation. I began researching the life of Bug Frutrell of Rich Square, Northampton County, North Carolina, my enslaved mulatto 3x great grandfather, six years ago. As per my usual practice, I began working on a family tree for the white enslaving Futrell family. I rapidly fell into the genealogical quagmire that is the Futrells of Rich Square. A handful of family lines were well documented and researched. Most lines were not. The one lineage book that was digitized and available online was riddled with errors. 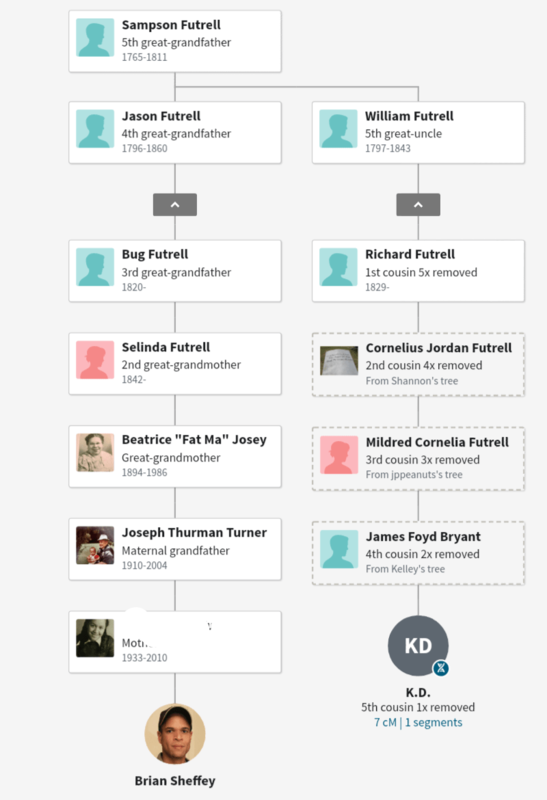 Like other parts of my ancestry, the Futrells used the same five or six names for their sons and their daughters, resulting in individuals who were either conflated into one person, or confused for one another. I reached a point where I was on the verge of giving up when a white Futrell DNA cousin, Becky, reached out to me on Ancestry to introduce herself, and to say hello. Like me, she was curious to know who our common Futrell ancestor was. Understanding that my connection to the family came through the enslaved Bug Futrell didn’t phase her in the least. She took that in her stride. Becky shared a copy of a family lineage book that is no longer in print: The Futrell Family. Simply put: this book was awesome. It remains the most accurate book about the Futrells that I have accessed. The paper trail backs up its findings. In short order, I had a workable and usable Futrell family tree. Armed with an accurate tree, I had a relatively short list of enslaving Futrell men in Northampton County to research who would have been of a suitable biological age to have fathered Bug. This kind of research involved finding Wills, estate inventories, slave insurance policies, deeds that cited enslaved people, contracts involving hiring out enslaved people – any relevant document that would contain the name Bug between 1819/20 and 1865, when Bug would have been emancipated via the Emancipation Proclamation. I found Bug cited in an appraisal for Jason Futrell of Northampton County after a month or so of searching. Jason was the right age, and lived in the right place, to be Bug’s father. DNA triangulation and segmentation showed I was more closely related to Jason’s white descendants than any other group of white Futrell descendants. 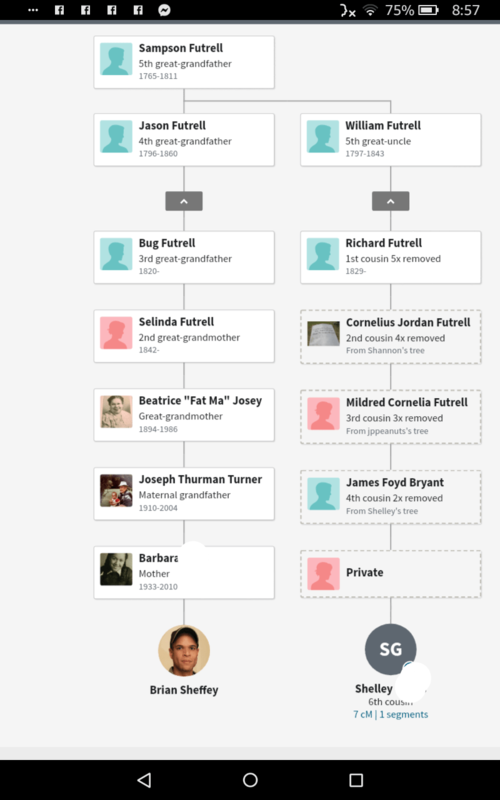 I shared more cMs and longer chromosomal segments with Jason’s descendants than any other Futrell descendants with roots in Northampton County, North Carolina. 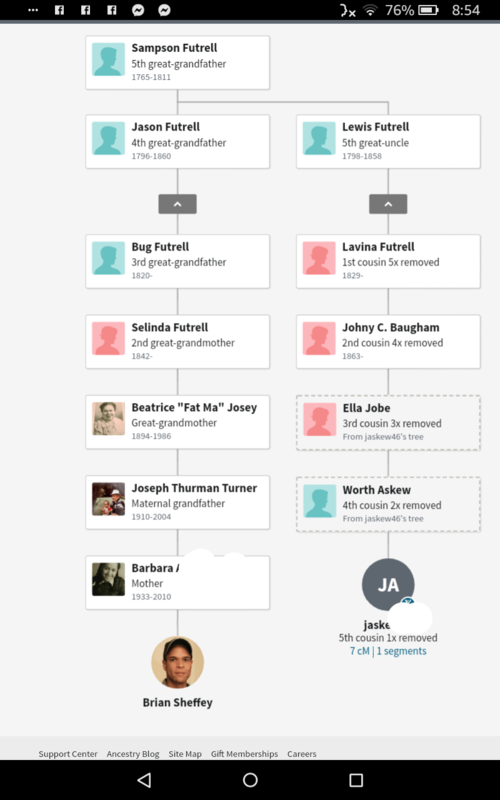 So…I added Jason as Bug’s father on my Ancestry tree – and waited for shared ancestor hints to pop up on Ancextry.com. I was waiting to see shared ancestor matches with Jason’s other children, as well as the descendants of his maternal and paternal aunts, uncles, and grandparents. I waited. And waited. And waited. There was nothing. Which was strange, considering the sheer number of white Futrell descendants I matched on Ancestry with deep roots in Northampton County. Fast forward six years later. I hadn’t logged into MyHeritage for almost two years. My research focus has mostly been on Ancestry. However, I was hearing so many excited reports about MyHeriage’s Theory of Family Relativity and AutoClusters that I had to check them out for myself. Who was the subject of the first theory? You guessed it – Bug Futrell. Who was his predicted father? Jason Futrell. Looking at my AutoCluster Report, I quickly saw my Futrell cluster. 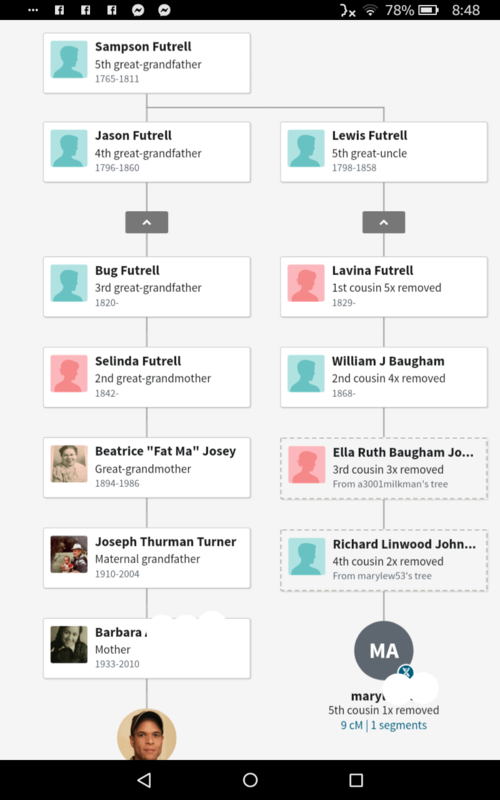 In and among my 15 Futrell DNA matches were six white Futrell cousins I knew from Ancestry. I went on to check a staggering number of messages in my MyHeritage inbox. There, nestled among my messages, were system reports from five years ago pretty much telling me that Jason was Bug’s father. I was estatic. I then became furious. Why had MyHeritage been able to report something five years ago that AncestryDNA had never even suggested? I hope part of why I’m still salty about this is relatively easy to understand. Confirming Jason as Bug’s father enables me to understand how, and through whom, I match descendants of the other mulatto Futrells in Northampton County. It strengthens my ability to find members of Bug’s immediate and extended family. It is critical in understanding Bug’s family’s story. Denying me that confirmation denied me the ability to even try to reconstruct the family history of the enslaved mulatto members of the Futrell family. The way its matching algorithm handles comparing DNA for people who are heavily admixed. Me being me…I have both. MyHeritage seems to be better equipped to handle both. The brick walls that crumbled this week involve both centuries worth of endogamy, as well as a high degree of relations between Europeans, Africans, and Native Americans occurring over centuries. On the upside, I can now begin the work of connecting the dots between the different mulatto Futrell family groups in order to understand how Bug connects to them. Brilliantassimo! not sure if that’s a word. Great job. I’ve been down on Ancestry,com for some time. Ever since they started replacing original docs with digital docs, removing marriage docs with county referrals, and lastly taking ownership and credit for information that you supply them with. I will now take a closer look at Heritage.